Making the most out of travel means making the least out of your luggage, it's as simple as that. But packing your luggage to fly "light as a feather" is an acquired skill. It is also highly subjective, so each person needs to determine what they need. Hence, Disclaimer: all luggage and packing choices are based on your travel destination and taste. This here is a short guide to minimalist packing for those who travel for business and pleasure and for no longer than one week. It also bears in mind my two hobbies: running and photography. This also will not do for backpackers. Rule #1: Checking in any form of luggage is *total rubbish*. Checked in luggage tends to get lost, more often than you would expect. I have traveled around the world multiple times and it took me only 1 flight to understand this first rule. And do you know why? Alitalia lost my luggage. It took a two hour line at the airport, countless (angry) phone calls and a 5 day wait to get my stuff back. Think I want to do that again? Rule #2: You divide your stuff into: "essentials" and "clothing." Pack your essentials into a carry on that has no-chance-in-hell of being downgraded to cargo. This does happen in economy-class (for more info, see how to travel in economy) more often than you would expect. Being downgrade-proof means that even if the airplane (and all the overhead compartments) is full, your carry on can come with you as you will be able to tell any flight attendant: "Dont worry, this can fit under the seat in front of me." 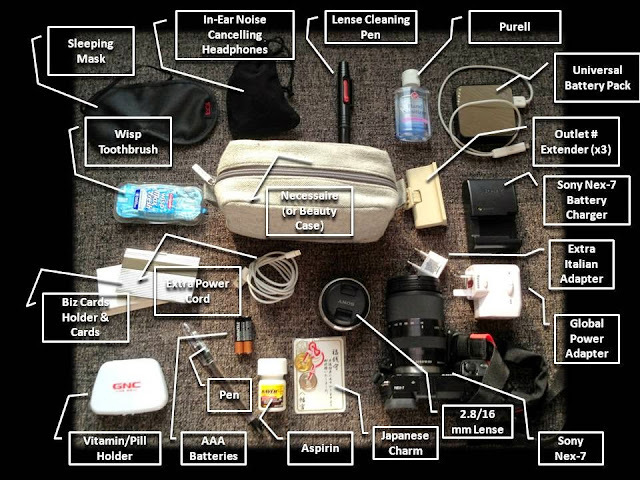 The definition of "essential" is what you cannot easily replace (or want to replace) if your luggage ever got lost. My camera, my laptop and my mouthguard (I grind) are my essentials. What are yours? Some examples: a Kindle, your favorite traverse flute, your prescription drugs, etc. Pack your clothes, instead, into a carry-on trolley certified for both International AND Domestic flights. Your clothing necessities will change based on destination, but unless you are going somewhere with sub-freezing temperatures, you should always be able to fit what you need in a trolley. 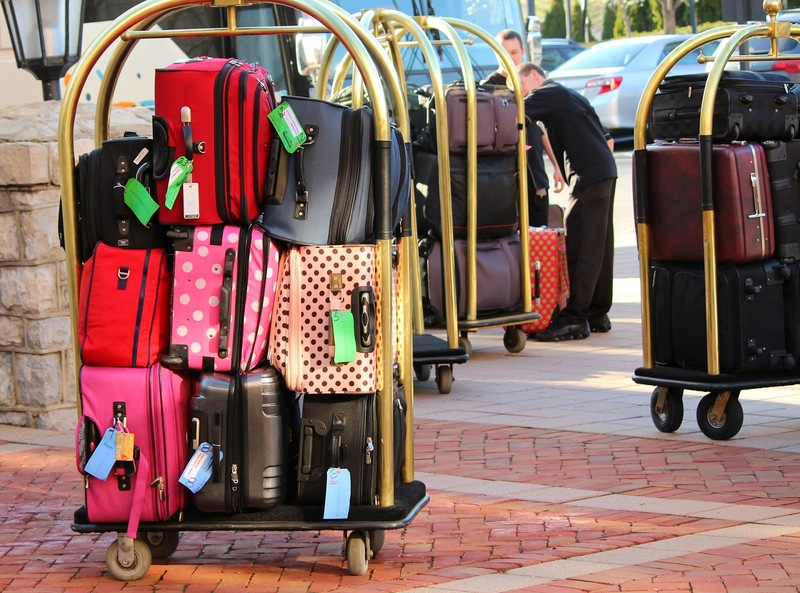 Rule #3: You spend as much as you can when it comes to your carry-on and your trolley. These two items are your friends and if you spend on them, they will be for a long time. They will also not explode open in the middle of a metro (happened to a friend), nor will their handles come off and send the luggage flying down the stairs (happened to me). Also, remember, you will not be checking-in these items, so you should not get any of that wear-and-tear from some overly aggressive thrower (that's how they call those who handle luggage on airplanes). Also, good wheels on a trolley will have you gliding through airports and stations, while cheap crap will have you cursing in each and every language you manage to pickup during your travel. As far as brands go, Tumi has GREAT carry-on bags made out of ballistic nylon or leather. Rimowa has instead some of the best trolleys in the world. The wheels on a Rimowa are so well made that not only they can resist to a lot of shock, they are also totally silent and incredibly smooth. If a stealth assassin needed a piece of luggage, he would choose a Rimowa. Looking into your carry-on smaller bag, you should decide what you want to bring with you and make it a routine. Remember "Up in the Air"? George Clooney had his packing down to a science. First of all, my "necessaire", better known as beauty case. Inside is the usual: 1 toothbrush, 1 small tube of toothpaste, 1 disposable razor, 2 band-aids dental floss, 1 lip balm (super important), 1 small tube of SPF 50 (for my shaved head and fair skin). 1 Pen (keep it close, and remember to fill out your border & customs forms while on the plane). 1 Small Tube of Aspirins - the wonder drug. 1 Pill Box - this acts as my mini-travelling-pharmacy and has saved me from late night trips to the drugstore using a language I dont know many times. It holds the following: 1) Zyrtec (non-drowy anti-allergy); 2) Benadryl (strong drowsy anti-allergy); 3) Ibuprophin; 4) Melatonin (for those 9-14 jetlag trips); 5) BetaCarotene (which I find helps me recover from jetlag, is good for my eyes and fair complection). One set of Sony MDRNC100D Digital Noise Canceling Earbuds These are the best in-ear noise cancelling headphone I've ever tried: I like them to be in-ear cause they take less space and the battery (one AAA) lasts 10x longer than any over-ear competitor. They are also less of a fashion statement then the average over-ear, so fits well with the minimalist philosphy. Do no travel without them or suffer the screaming children and chatty neighbor. 2 AAA batteries. These are for backup just in case I need them for my noise cancelling earbuds. A pack of Wisp. I also have a travel toothbrush in my "necessaire", but nothing wakes you up after a long flight like cleaning your teeth. And with the Wisp you get to do it quickly and with no mess. Purell or your favorite brand of germ killing cream. I have loads of this stuff at home, and (as a travel germofobe) I never go to conventions, the metro, or airplanes without a bottle. One extra USB "Fire" cord that will supplement either my iPhone5 or my iPad Nano. In terms of outlet adapters I use thee items: 1) my Brookstone Global Adapter with 2 USB Ports. This power adapter is *exceptional*, not only it works almost everywhere I go, it is also sturdy and the two extra USB ports are a real kicker. Keep in mind, its a "adapter" not a transformer. I dont want you to see your electronics melt cause you plugged in 110 watt in a 220 socket. 2) A outlet extender, useful to turn 1 adapted outlet into 3. 3) An extra USA>Italy adapter. I visit Italy often, so I decided to stack. 1 Business Card Holder with Business Cards. I actually always end up putting the most important business cards I receive in the card holder during my trip back. These are the cards of people I want to contact (and many times thank) as soon as I'm back at my desk. My 2nd Camera, the Sony Nex 7(see my review for the camera here soon). This is a great camera: with 24.3 MegaPixel, it's APS-C sensor and 10 FPS, it's performance is on par with some of the best DSLRs yet it weight a (without the lense) only 330 grams! Less than a pound. Amazing. Sony 18-200mm F3.5-6.3 - this is a great lens for walking around, but also a heavy one. It is a must if you think you will be shooting anywhere with people. Sony 16mm f/2.8 lens - a great wide angle lens, perfect for panoramas, buildings, or for just being very light. One Nikon Lens Cleaning Pen. This tool is portable and easy to use. It will *save* your lenses and deserved 5 stars. Last but not least: a beanie and a scarf. It gets COLD on some flights. See the detailed guide to what is what and how big each are in the image below. All of these items go into one "soft" carry on bag. I use a Tumi, similar to this one: Tumi Luggage Carry-On. Mine is from years ago so I cant find it for sale anylonger. Most Tumi's are made from ballistic nylon and are so resistant that if you dont' board them they will almost never break. I also fit my 16 inch XPS laptop, my iPad Nano, my chargers and my mouse in the Tumi bag with no difficulty. A small post-man bag (used for walking the town, carrying my camera and generally liberating my pockets from the tyranny of bulging wallets). ...and there is still space left! Also keep in mind, that you yourself are a piece of luggage. I normally wear on my my bulkiest shoes (I wear boots when its cold or rainy), and hang any heavy jacket I need on my trolley till I need it. The final step is to stack it onto your compact-4-wheel-trolley and hit the road.